Convenient parking is available for Chicago Museum Campus. Refer to the map for more information on nearby parking or to reserve a guaranteed space online. 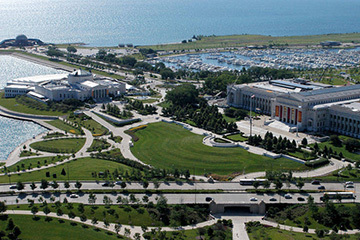 Chicago Museum Campus is a 57-acre park near Lake Michigan that is home to the city's three most notable museums: the Adler Planetarium, Shedd Aquarium, and Field Museum of Natural History. Also located nearby are Soldier Field and the Lakeside Center of the McCormick Place.